Catch the eye of visitors to your yard by placing this Home Bazaar Fishing Lodge Bird House in your landscaping. This highly detailed shelter brings your love of fishing to the forefront, while providing small songbirds a cozy roosting spot. Its textured, beige body evokes a weathered structure, while the blue roof celebrates water. The blue frames of the faux door and windows match the roof, while fence sections, a barrel, and a fishing rod at the front of the home add realism. A sign reading "Fishing Lodge" with a fish figure on it rests above the door, completing the whimsical piece. A 1.25" diameter opening above this sign allows birds to use the home, and the deep design helps protect the nest from predators. The roof overhang not only aids in directing rain away from the entry; it also allows for ventilation gaps on the sides, regulating the interior temperature. Drainage holes on the base allow water to exit the nest, and a small back panel lifts upward for seasonal maintenance. A white rod forms the peak of the roof, and a rope extends here for hanging the shelter. For even more display options, place its flat base on a level surface or pole mount it using a mounting bracket (not included). The wooden construction enhances your backyard, as well as the rustic feel of the piece. 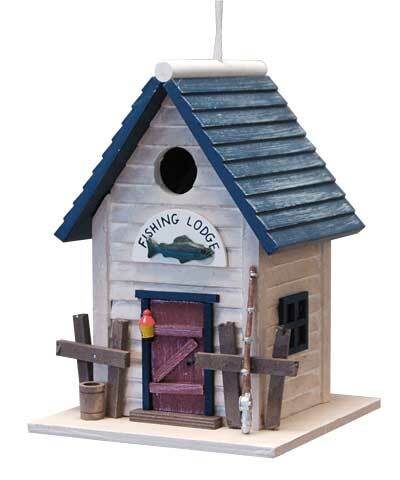 Display your fishing hobby in your bird garden with this Fishing Lodge Bird House.